Maiden Lane is a vibrant community centre in Camden. Our users come from Maiden Lane, Agar Grove and St. Pancras Way Estates, Elm Village and Camden Square and some activities attract users from across Camden. The Centre provides services and activities for everyone in our community, catering for a wide range of interests and age groups. The Centre is well-equipped, particularly with computers that are supplied, managed and maintained by Camden Online. Basic computer courses offer free access to the World Wide Web and e-mail. Maiden Lane also provides accredited training and help with job search. 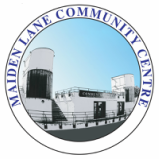 Maiden Lane Community Centre provides one Youth Drop-in a week with a wide range of activities taking place including sports, cooking, PS4. We use these sessions to consult with the young people about the programme of activities. We also work with Infinity Elite Cheerleaders to provide one Senior Cheerleading session a week. We partner with Kentish Town Community Centre to provide a 5-a-side Football Tournament once a week. Our holiday schemes for young people include activities days, trips and residentials. The Centre has a high tech sound recording studio. As part of our youth provision we run sound recording sessions for young people to learn to use the equipment and make music. Maiden Lane manages ﻿Camden Square Play Space﻿ providing a term time after school care service for children aged 4 to 12 and holiday play schemes. The childcare services we provide at Camden Square were rated OUTSTANDING by Ofsted in 2016. We also run Under 5’s Drop-Ins at Camden Square. The Maiden Lane Pre-School provides 15 hours free childcare for 2 year olds and 3 year olds who meet the eligibility criteria. In 2015 the Pre School was inspected by Ofsted and was rated ‘GOOD’. Maiden Lane Community Enterprises maintains the grounds on Maiden Lane Estate. The aim of this part of our programme is to provide training and work opportunities in horticulture for local people as well as improving the local environment. Camden Community Radio is based at the Centre and is in the process of developing a locally based community radio. The Community Radio Group provides training for people interested in developing their skills in Radio Production. The Centre encourages local people to develop and run their own groups and activities, to be active in their community and influence the decisions that affect their lives. The Camden Town Shed is a leading example of a volunteer led project. The Shed provides workshop space where older people can work on practical projects. We provide accommodation for the Ward Councillors Surgeries and for meetings and events that provide information and support to local people and organisations. The Maiden Lane Food Bank is provided in partnership with Sainsbury's, it supports some of the most vulnerable people in Camden Borough.